Bleeding heart is a perennial flowering plant that is most recognizable by the drooping heart-shaped blossoms of the flower. The original form of the plant is white and blooms for approximately one week in early spring. The more common variety is dark pink in color with blooms that last the entire summer. Bleeding heart is a shade plant, which thrives in partial sunlight to full shade making it an ideal plant to grow in indoor spaces. Bleeding heart flowers look like tiny hearts. Select a pot that is twice as wide as the root ball of the plant. Place a 1-inch layer of gravel into the bottom of the pot to provide proper drainage. Fill the pot 3/4 full with a rich potting soil that contains plenty of organic matter. Most potting soils labeled for indoor plants will suffice, as they contain extra nutrients that indoor plants require. Water the bleeding heart plant at the initial planting until the soil is saturated but not soggy. After the initial planting, water the plant every one to two days. Do not allow the top of the soil to dry out, as the plant will stop blooming if this occurs. Place the bleeding heart plant in a location where it receives plenty of indirect sunlight. If the plant is near a window, move it back approximately 1 to 2 feet so that the sunlight does not hit it directly. You can also filter the sunlight by installing a sheer curtain over the window. 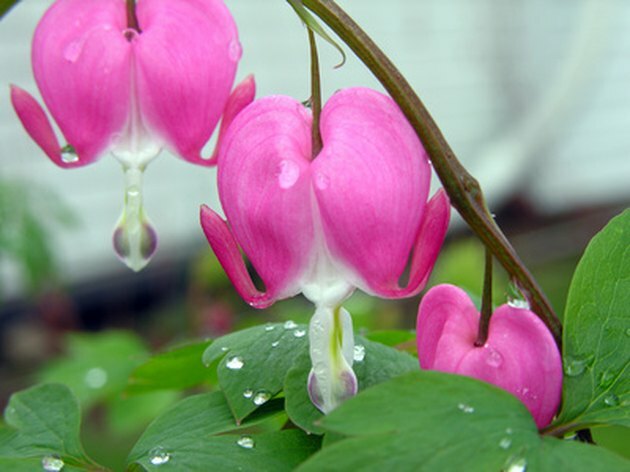 Place a humidifier in the same room as the bleeding heart plant during the winter months to keep it blooming. If a humidifier is not used, the plant will go dormant and lose its blooms and most of the leaves. Dormant plants should be watered only once or twice per month until spring. Prune the plant regularly to remove dead stems. Cut each dead stem off as close to the base of the plant as possible using pruning shears. Fertilize the bleeding heart plant with a liquid-based fertilizer once per month. Fertilizing should begin in early spring and occur until the plant stops blooming. If you provide a humid environment and the plant blooms continuously, fertilize it monthly on an ongoing basis.